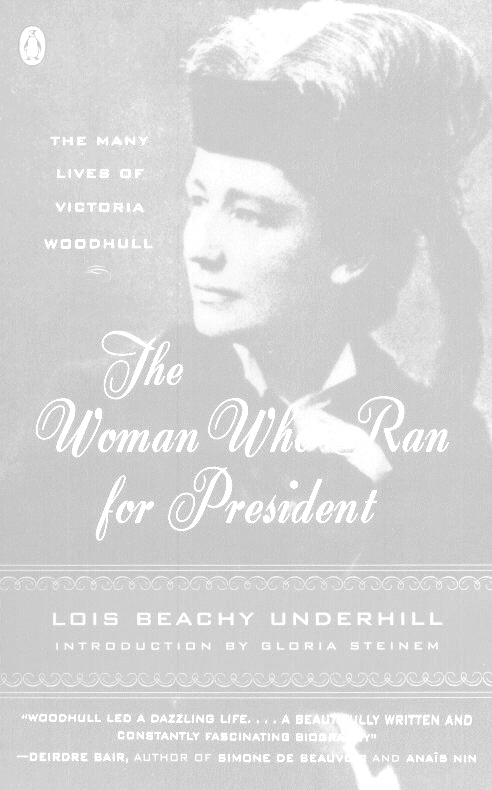 "THE WOMAN WHO RAN FOR PRESIDENT, THE MANY LIVES OF VICTORIA WOODHULL,"
Bridge Works 1995, Penguin 1996. Introduction by Gloria Steinem. Under option for a major motion picture. Victoria Claflin Woodhull, New York's first self-made woman, was the first female Wall Street broker, the first woman to testify before the United States Congress on suffrage for women, the first woman to organize a political party and the first woman to declare as a candidate for president of the United States. She gave new life to a divided and dispirited suffrage movement. A spellbinding public speaker with a powerful personality, she was the most famous woman in America in 1872. Woodhull was also a figure of controversy-- a political radical, a muckraking newspaper publisher who exposed abuses of capitalism and power by business and social leaders, an advocate and practitioner of free love and a spiritualist. She became the first woman in America to be demonized by the press, by the editors and publishers who wouldn't tolerate the threat she presented to the manly status quo. Led by Susan B. Anthony, Woodhull's older, more conventional suffrage colleagues bowed to public pressure and abandoned her. When the suffragists wrote their history of the movement, they minimized, and even omitted, Woodhull's contributions. Historians since have followed the suffragist lead. A Sampling of Praise for Lois Underhill's "The Woman Who Ran For President"
Woodhull rejected the 19th century definition of women's role. Women must "own themselves" she said. In her life and views she was more than a century before her time. Lois Beachy Underhill had access to previously unavailable correspondence, photographs and autobiographical writings for this first modern biography of Woodhull. Gloria Steinem writes, in her introduction, that Woodhull's "outrageous strength" inspired her to be bold about money, and she advises today's women to "catch the spirit of the real Victoria Woodhull." The author, Lois Beachy Underhill, can be contacted traditionally or digitally - if you have a specific question or would like to leave a greeting, please sign our Guestbook. A must for any syllabus or course. American History, Feminist Studies, Political Science and Presidential History courses would all be enriched by an examination of the life and achievements of Victoria Woodhull. How Many Have Visited: Thank you.